Looking for sleep that’s cooler than the other side of the pillow? Well then it’s time to meet the new Bedgear Dawn performance pillow! Bedgear’s cooling technology is among the best in the business and this week Sleepopolis has decided to test their new Dawn performance pillow. Is this pillow cool enough to handle the heat? Continue reading below for my full review of the Bedgear pillow. The Bedgear Dawn pillow’s construction combines a multitude of materials. For starters, they use their own climate control fabric, Ver-Tex. This Ver-Tex fabric works to deflect heat while maintaining a cool to the touch feel. Next up are the air ventilated panels. These panels are designed to keep air flowing, moving heat away from your head, neck, and shoulders. While doing so, the pillow still possesses a very cool core temperature. Additionally, these air flow panels only allow for one-way traffic. In other words, no allergens are able to enter the pillow through these chambers. This Bedgear pillow has dimensions measuring 20″ x 26″. The crown and blend of the pillow bring silk fibers and boost foam together to create a pillow that won’t bottom out. This feature is also beneficial with regards to support and motion transfer. No excessive bounce takes place, meaning the pillow allows for a deeper, more enjoyable sleep. The Bedgear Dawn pillow’s cover is constructed from a mix of polyester (68%) and polyethylene (32%). The combination of these two materials makes for one of the coolest pillows I have tested to date. When touching the pillow you immediately notice the cool feel this pillow has to offer. Along the perimeter of the cover is an airflow panel with the model name of the pillow (Dawn) stitched into it. The panel is built from a mesh material, helping to improve the airflow of the pillow and maintain that cool-to-the-touch feel. Aesthetically, I like the look of the pillow. 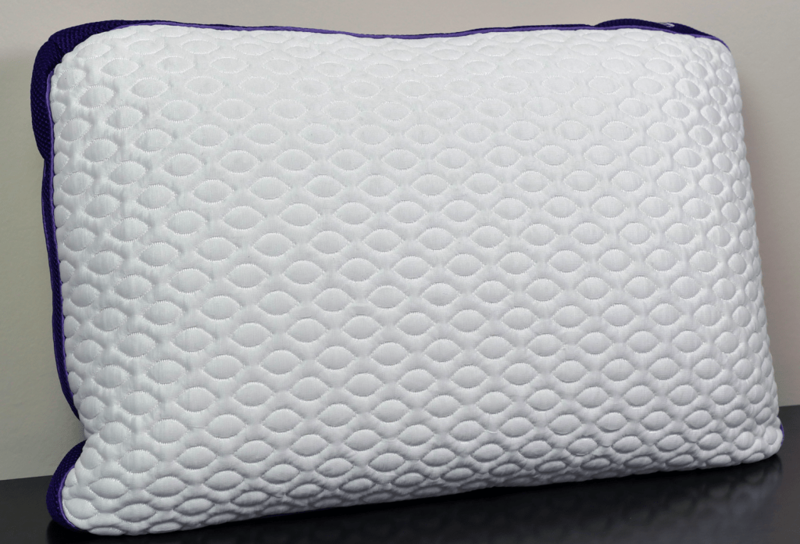 The purple air flow panel meshes nicely with the modern design stitched into the white fabric on both sides of the pillow. The best method of care for the cover is spot cleaning. The cover should not be placed in the washer / dryer. Additionally, there is a zipper running horizontally across the pillow that allows sleepers to open up the pillow to clean from the inside (you can also remove the latex insert for a thinner pillow if you prefer). This pillow provides a soft, yet dense feel. When first lying your head down, there is a fluffy, inviting feel. From there, the pillow does not go much further. What I mean by that is, it does not continually get softer. The pillow maintains the same feel regardless of time spent on the pillow or head placement. With that said, support is tricky on the Bedgear pillow. They created the pillow for stomach sleepers and small body types. Yet, as a stomach sleeper I found the pillow to be too dense. Personally, I felt as if it was a better pillow when I slept on my side. The amount of cradle I got on my side was great. It was just enough push-back to keep my spine aligned, but not an excessive amount leading to uncomfortable sleep. On my stomach, I prefer a slimmer pillow. This does not mean the Bedgear pillow is a poor choice by any means. It is just a personal preference which varies for every sleeper. If you are a stomach sleeper who prefers a slightly thinner / low lofted pillow like I do, then I believe the Bedgear Thunder performance pillow is another good option. It is very similar to the Dawn in terms of feel and cooling capabilities, but has a slightly thinner loft. Response time for the Dawn pillow is nearly instantaneous. Right as you lift your head from the pillow the foam inside is already back to normal shape. This is a benefit for us sleepers because we can rest worry free about waking up to a flat pillow. Probably the most pleasing attribute about the Bedgear pillow is cooling. This pillow has very high breathability and never once heated up during the night. When making initial contact with the pillow, you notice how cool it truly is. Their cover and air flow panels help make this pillow one of the coolest I have slept on to date. Spot clean only – this pillow is to be spot cleaned only, not placed in the washer / dryer. Very little smell – when first removing the pillow from the packaging, there was very little smell. What little smell there was lasted for about 2 days before completely diminishing. Who should buy the Bedgear pillow? All in all, the Bedgear Dawn performance pillow is quite impressive. Although it suited me better on my side, I did enjoy the cooling features and amount of support I received overall. Sleep on their side – although the pillow is designed for stomach sleepers, I believe it is a better fit for those that sleep on their side. Stomach sleepers who like moderate loft – this can still be a great pillow for stomach sleepers, but you’ll definitely want to like a pillow with a moderate level of loft and moderate push-back. Want a very cool pillow – to date, this is the coolest pillow I’ve slept on. The materials Bedgear used to make this pillow come together to create a cool to the touch feeling as well as a pillow that works to dissipate body heat from your head, neck, and shoulders. Like a thicker, more dense pillow – designed to maintain its shape, even when pressure is applied, the Bedgear Dawn performance pillow is slightly thicker than most pillows I have tested. As a dense pillow, it is very responsive to movements. Looking for a little more information on the Bedgear pillow or ready to buy? Visit Bedgear.com. 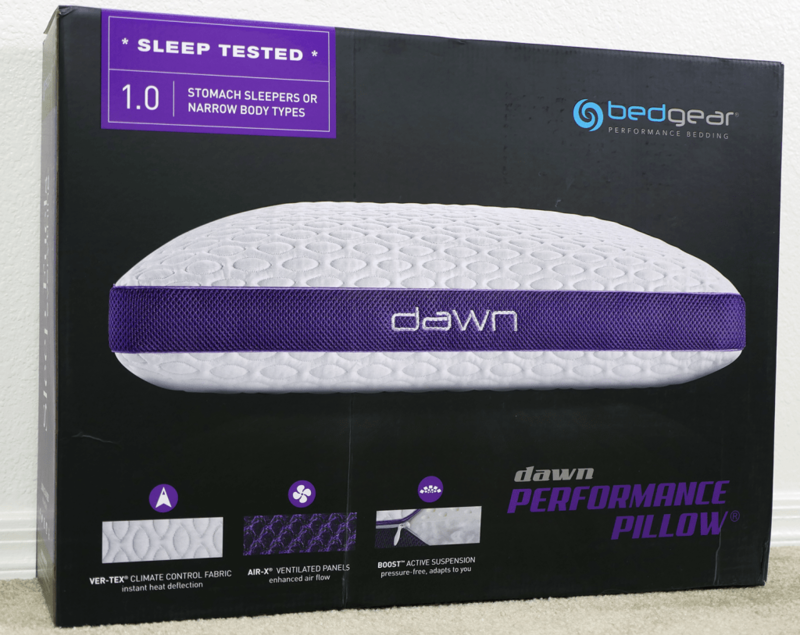 The Bedgear Dawn performance pillow is impressive. From the cooling attributes to the support, this pillow gets the job done. There is no need to flip the pillow over during the night because of the exceptional cooling qualities the pillow possesses. From a supportive standpoint, the pillow does a great job. For some stomach sleepers there is a chance it could be slightly too dense. As a side sleeper, the Bedgear pillow has a very nice amount of support. All in all, the Bedgear Dawn pillow has a great build and is priced right for the quality and durability you are receiving.